There's always more going on at the Consumer Electronics Show than first meets the eye. There are often unannounced prototypes to be played with, hourly technology demos, exclusive press briefings and fun-for-five-minutes tech toys. Walk the vast show floor and you'll also find the world's thinnest, biggest and smallest tech; useless gadgets; pointless gadgets; gadgets you'd half-forgotten about (or are only available in the US). CES is big, loud and overwhelming. So what stands out? 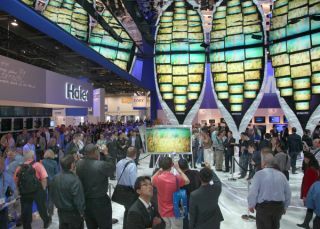 Here's TechRadar's take on the trends, themes and patterns of CES 2010. At CES 2009, 3D TV was very much in the novelty 'concept' stage. But what a difference a year makes. 3D TV the undisputed star of this year's show, backed by some of the biggest names in the consumer electronics business. Panasonic, Sony, Samsung, Toshiba and LG have all shown 3D-capable HD TVs this year; the Blu-ray 3D specification has been finalised; and Sky+ HD boxes will start receiving 3D telly transmissions later this year. During the Samsung press conference, animated sci-fi toon Monsters vs. Aliens was announced as the "world's first Blu-ray 3D disc". Want to recreate that 3D cinematic experience in your living room? You'll need the disc, a 3D-capable TV and a Blu-ray 3D-compatible player. The camcorder market is increasingly being sliced in two. At the one end, there are the cheap Flip-a-like video shooters like the new Sony Bloggie and Sanyo Xacti VPC-CS1. At the other, you'll find the high-end, prosumer dad-cams such as Sony's impressive HDR-AX2000E. Panasonic has also announced the world's first Full HD 3D camcorder. A $21,000 price tag is aimed squarely at pro film-makers rather than avid, weekend Youtubers. Just as Persil washes your whites whiter every year, so compact cameras continue to be stuffed with extra goodies. The new Samsung CL80, for example, features an OLED touchscreen and built-in Wi-Fi. While the freshly-built Sony Cyber-shot HX5 delivers HD video recording and GPs functionality for automatic geo-tagging. At CES there's usually something genuinely innovative from some small company you've never heard of. This year, Light Blue Optics was showing off its Light Touch system, a mini-projector that "turns any flat surface into a 10-inch touch screen." iPod accessories. Hundreds of 'em! You know you've taken a wrong turn at CES when all you can see is stands selling nothing but iPod accessories and brightly coloured iPhone cases. OLED displays haven't quite made a full transition from mobile phones and MP3 players to bigger devices. Organic LED technology is still hovering nervously in the wings, as if afraid to make an entrance. Nevertheless, OLED is certainly here at CES 2010 if you know where to look. Dell, for example, teased a Studio XPS laptop with an OLED display, while Samsung showed off its 700Z OLED photo frame. Samsung, along with Sony, also pushed OLED into 3D territory with gorgeous-looking concept HD TV models. Mini projectors that are small enough to fit inside a mobile phone were a notable feature of last year's show. But real, hold-them-in-your-hands products were few and far between. This time around, pico projection technology has been spotted in the Samsung W9600, LG eXpo and LBO's Light Touch system. Why would you need this miniaturised projection technology? To beam video onto a nearby wall or to display a virtual keyboard on a tabletop. Obviously. Is Microsoft cost-cutting hobbling Project Natal? It's great news that Microsoft's mo-cap sensor for the Xbox 360 will be available for Christmas. But the news that Natal "consumes between 10 to 15 per cent of the Xbox's computing power" might spell trouble for software developers who are already pushing the Xbox to its limits. Adding a dedicated processor to Natal would sky-rocket the price. But isn't it worth it when you're trying to redefine a gaming experience? Panasonic's roadmap for its Secure Digital eXtended Capacity memory cards tops out at 2TB, taking in 48GB, 64GB, 128GB, 256GB, 512GB and 1TB cards along the way. Expect to be holding a 128GB SDXC card in your hand by the end of 2010 and wondering how you're going to fill it. While 2010 has been dubbed the year of 3D TV, it's also shaping up to be the year of the giant PDA. Or e-reader. Or Slate. Or MID. Or Tablet. Steve Ballmer unveiled HP's slate PC during his ho-hum keynote speech, Compal flashed an Android tablet (with added Nvidia Tegra) and T-Mobile jumped on the bandwagon with Vega. E-readers are also proving wildly popular, their ranks bolstered by new devices such as the Plastic Logic QUE proReader, dual-screen Entourage Edge and the Fujitsu FLEPia (which boasts a colour display).